All transactions are safe and secure with a reliable history in online purchasing behind each of our associates. Buy the Indiana Jones Fedora Hats to own Indiana Jones clothing and merchandise. Dress for adventure with an officially licensed Indiana Jones Fedora hat, available in three styles: weathered cotton, wool felt, and crushable wool felt; shown from top to bottom respectively. George Lucas and Steven Spielberg based Indiana Jones costume and general appearance on an amalgamation of several characters, most notably treasure hunter Fred C. Dobbs (Humphrey Bogart) from The Treasure of the Sierra Madre, and adventurer Harry Steele (Charlton Heston) from Secret of the Incas. Wear your hat with a rugged Indiana Jones jacket (bull whip optional). 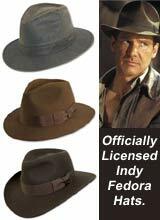 In addition to the Indiana Jones Fedora Hats above, browse the Indiana Jones Clothing Gallery for more apparel like men's and women's clothes, kids shirts or hoodies.